Cutting the edge of the porch floor has been holding up any further progress installing the railings. I was going to use some special straight-edge clamped to the floor or something, but planning it was taking so long, I just decided to snap a chalk line and do it free-handed. Actually, Denis did it free hand. He’s got an eye for detail. It was sunny and cool. After the floor was cut, we put up some railings. Railings! It’s taken so long! We only got two sections up before it started to get dark. Still, I’m very happy about it. And future work will be much easier and much less scary because I’ve already done it. The middle post is un-cut, so it’s too tall. 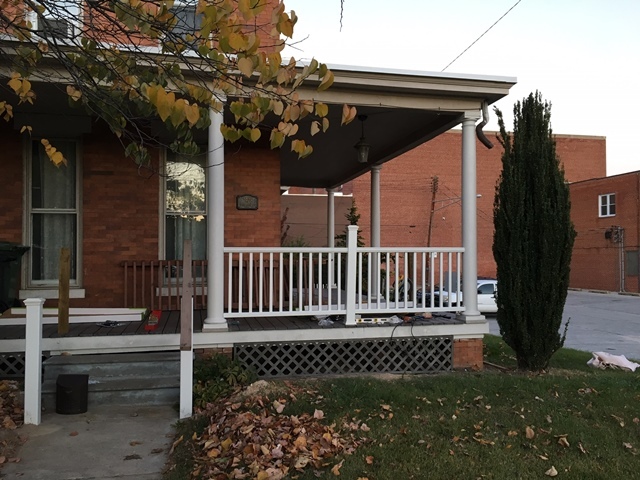 I’ll be cutting it when the other railings are in place and I can decide how tall they all should be. 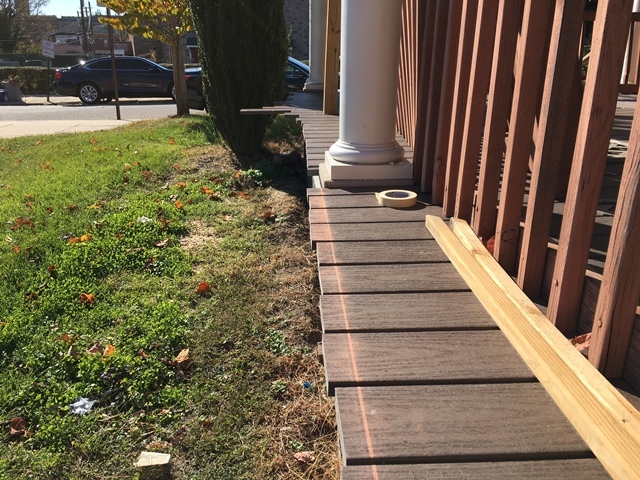 This entry was posted in Projects, Repairing the Porch. Bookmark the permalink. Wow! It looks so fancy and finished! I think you made the right call just snapping the line and cutting it. Well done, guys! …or you could mount a hanging basket bracket to the post… Everything looks great!